Search field/box is an essential part of a website, because it enable it's visitors to search for other related article that might be available on the site. But if the website you visit is not having a search box -mostly due yo technical problems -it does not mean that you the visitor cannot search out other content of that website. You can. And a tool you need is Google. So as long you can reach google.com you can search any website that is searchable even though the website does not have it's own search box. Thus, to use google.com to carry out a search on a website you need to include a search a Site: search operator along with what you want to search for in that website. 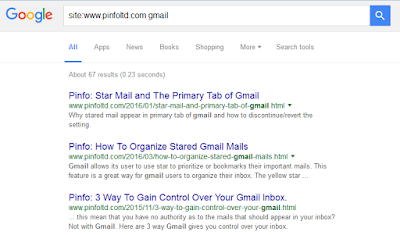 For example, if you want to search for our article that talks on Gmail on this website/blog and our search box is not functional, you can go to google.com and type site:www.pinfoltd.com gmail in Google's search box and click search. 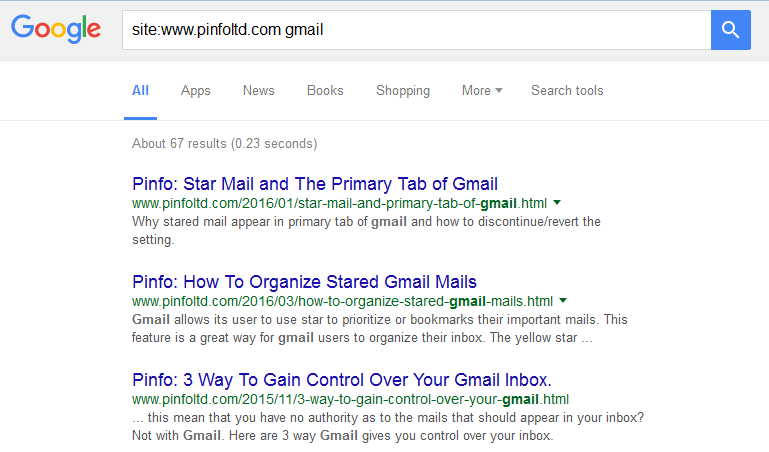 All the result Google will bring for Gmail will be from the website that preceded gmail which is www.pinfoltd.com. If you want to search a website that do not have a search box functionality of it's own, then go to google.com type site:(URL of the website) (what you want to search in the website) and click Search. Note: there should be a space between the website URL and what you want to search for, and they should be written without the brackets/parenthesis, but there should also not be a space between site: and the website URL. The image above is a perfect example. Sharing is a great ideal. Please click the share button so your friends can also get to know about this.